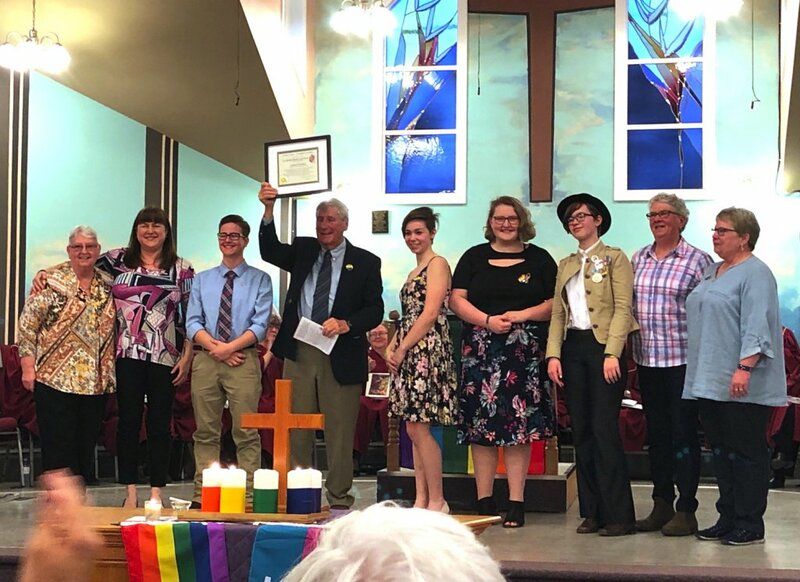 On Sunday, April 7, about sixty people gathered at Cole Harbour Woodside United Church to celebrate the end of a year-long project: to become an "Affirming" church. Open and Affirming is an official designation in the United Church asserting the full inclusion of gay, lesbian, bisexual and transgender people in the church's life and ministry. 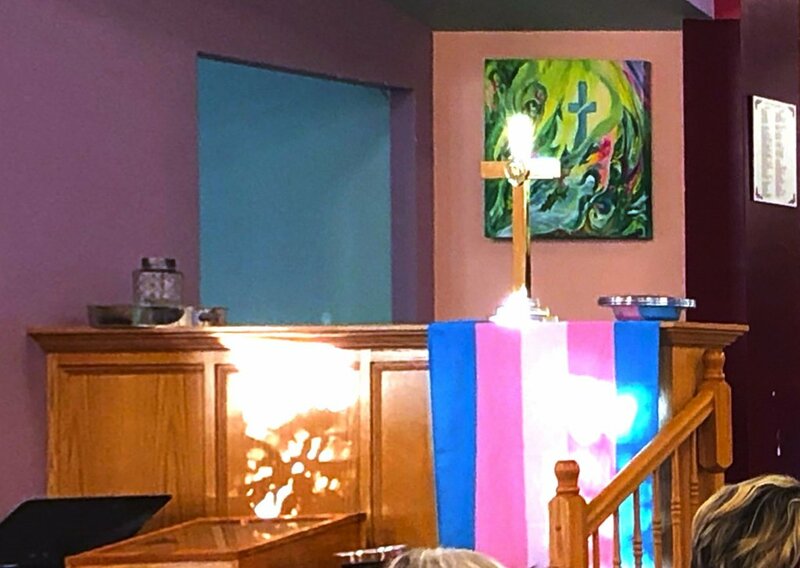 Many United churches -- sixteen in Atlantic Canada, over two hundred in the country -- are Affirming. Becoming Affirming is sometimes a protracted and divisive journey, always a thoughtful one, and a bit of a risk for a congregation, so the finalization of it is a special event. Rev Michael Mugford presided and introduced himself: "If you show up here on a Sunday morning, you get me, you get the same thing." As soon as I walked into the worship space, a couple from my old home church, the now-closed United Memorial in Halifax's North End, waved for me to sit with them, and I caught up a bit. They normally attend Hope United, also in the North End, but had come to The Dark Side for this special service. The ever thoughtful Anne Hebb, from Bedford United, who has guided many United Church congregations through the Affirmation process, greeted me with a hug. She encouraged someone else about my age to sit with me, we did introductions and I learned that he was just starting the journey of coming out. Cake fuels every United Church function, and at the cake social after this one, I encouraged him to consider me his Dirty Gay Uncle Dan, and to hit me up with questions on any topic from lube to literature to love. Rev Leslie Hamilton, who was a student minister at United Memorial, delivered the sermon. "I identify as queer. It's such a lovely word. It's a word that was kidnapped for evil, and I wrestle that lovely word back into my world every day. Evil will have to find another word." She also had a lot to say about the value of putting up rainbow flag symbols. "Rainbows are a sign of life for oppressed people everywhere. When I see a rainbow, I relax a little." Wayves will be publishing her full sermon next week. The choir sang a very chipper hymn about being a little queer: _My Love Colors Outside The Lines_ out of the new United Church hymnary. Every time we got to the lines in the chorus, "We’ll never walk on water // if we’re not prepared to drown, body and soul // need a soaking from time to time" you'd hear people giggling. Click here for a very pretty performance of it. Cole Harbour Woodside United's website is https://chwuc.ca/, they're at 15 Bissett Road, just past the south end of the Forest Hills Parkway. Their regular worship time is 10:30 am, but at 10:00 in the summer, the May Long Weekend to Labour Day.